Welcome to another day of MFT's august release countdown! Only a few more days until the brand new goodies are available in their store at 10pm on August 12th. 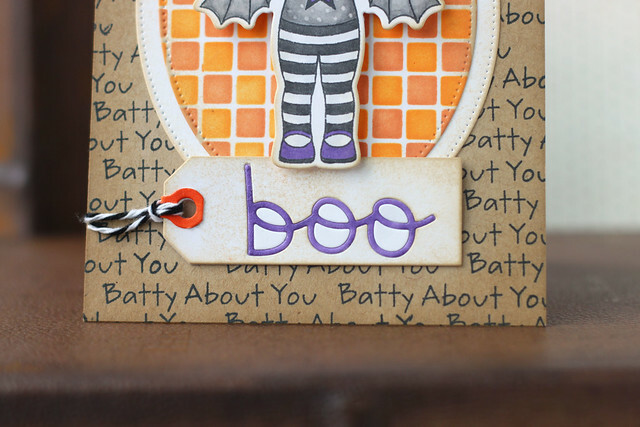 I mixed a slew of new product together to create this one card: batty about you stamp set and matching die-namics, the small checkerboard stencil, the trick or treat die-namics, and the tag talk die-namics. First off, I covered the background with the batty about you sentiment, keeping it a little random looking. More spooky that way, no? Then, I used their new checkerboard stencil on an oval die-cut. I stenciled in some orange ink, then moved the stencil over and sponged on more ink in a slightly darker orange. I'm in love with this stencil! Does the bat-girl look a bit different to you? I couldn't resist doodling some extra hair, although she looks super cute without bangs too. I love how we can customize stamps to look a little different! The star on her shirt is from another new set, geek is chic. I achieved the polka dots on her shirt by way of a colorless copic blender. The tag was the perfect size to ground our little bat-girl. 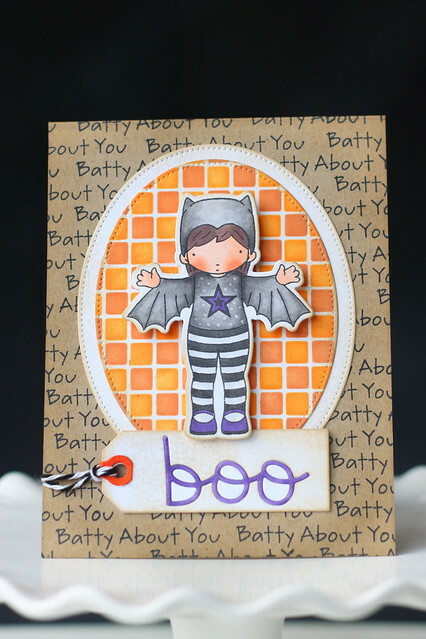 I die-cut the boo sentiment into the tag, colored it in the same purple as her star and placed it back into the tag. I hope you like what I've created! Visit the MFT blog for a list of participating blogs today! That is one beautiful bat! Loving the extras and your coloring style. Go girl! These cards are so awesome; cute and pretty! Such a cute card and such a cute stamp!!! Hi Elena! LOve this little trick-or-treater!! Love the depth the two-color stenciling gave the oval. And, my new favorite background technique! Great word background and oval mat. Love this adorable card, and all the "special effects"!! The background and inlaid die are superb!!! Very cute card. Love the background and your coloring. :Like how you made the background papers. I love your card, but I'm just plain in awe of how you used the stencil and made the background. You made it so dimensional with the darker shading on some of the squares! I'm going to have to add that stencil to my ever-growing list! Thanks for sharing! So cute, Elena! I love how you used that stencil, and what a cool tiled background it made. Love your coloring too. These little PI girls are so much fun. Another adorable MFTs Halloween card! I am loving these cards, they're so darn cute! I just LOVE this card!! Absolutely adorable! !